Depending on where you live and play outdoors, wildfires may be more of a risk than earthquakes, floods or tornadoes. While some areas are more prone to wildfires than others, the right (or wrong) combination of meteorological factors (humidity, temperature, wind, etc.) and density of vegetation can create the optimal conditions for a fire almost anywhere. Here in northwestern Alberta, wildfires are almost a seasonal occurrence. The whole world watched the destruction waged on Fort McMurray in 2016 by the epic wildfire that for nearly a week burned its way across nearly 1.5 million acres of forest, farm, residential, commercial and industrial land and it continues to smolder in places as of the date of this post. Depending on where you travel through parts of northern British Columbia, Alberta and Saskatchewan, you will encounter endless miles of rampikes littered along the landscape, creating an eerie succession of boreal wastelands as a result of the rampant destruction. 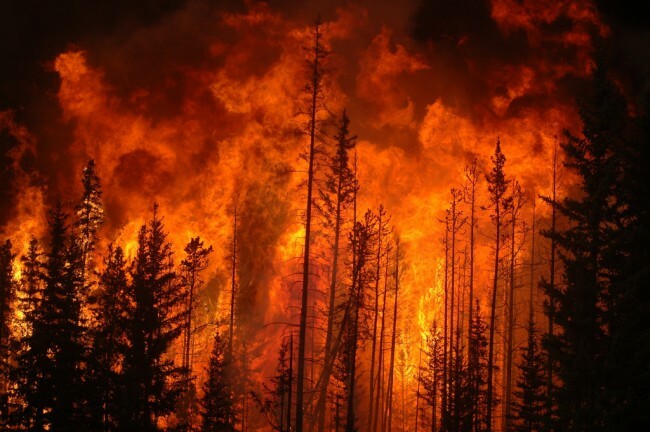 Wildfires can start from both manmade and natural sources and spread quickly, sometimes in multiple directions due to continually changing wind. The embers of fires can be carried for several miles on high winds, jump areas and ignite new fires in completely new locations adding to the danger and complexity of safely leaving the wilderness -especially if you are in a remote area at the time. If you are able determine there is an active wildfire, stay calm, but leave the area immediately. Hopefully you have a basic familiarity of the terrain specifics in all directions around you from which you can decide the best avenue of retreat. 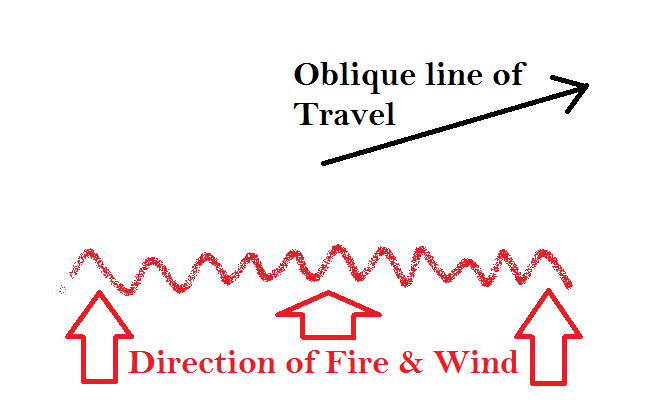 You will want to head downhill from the fire if at all possible since both heat and flames travel upwards faster than they do downwards. Regardless of whether you are moving up or down hill to escape, be sure to stay OUT of canyons, draws, valleys and any other "channel" type terrain features that reside on an incline since they act as chimneys and draw both heat and smoke up through them. Smoke inhalation is the leading cause of deaths from fires of all types and causes thermal injury to the upper airway, irritation or chemical injury to the airways from soot, asphyxiation, and toxicity from carbon monoxide (CO) and other gases. You may need to protect your airway from the smoke by soaking a cloth such as a rag, spare t-shirt, or even a sock with water and using it as makeshift respiratory protection. Alternatively, you can cinch the shirt you are wearing high enough around your lower face to allow yourself to breath inside your clothing. Stay upwind (and down hill) of smoke and fire. If the wind is at your face and the fire is to your back, keep heading into the wind. 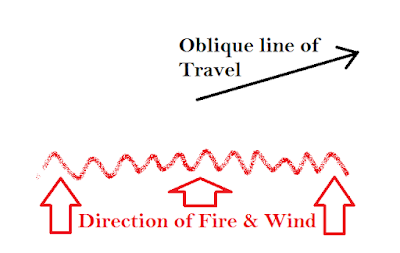 If the wind is coming at you from the same direction as the fire, move away from both at an oblique angle so that you work your way out of its path, as opposed to attempting to outrun it on its course. Remember that sparks may have blown ahead of you on the wind, so make movements that won't risk leading you into a second fire. Areas least likely to fuel a fire, such as open fields or if the situation demands and safe enough to do so, any area that has just burned. The risk from smoke will be greater, but all of the existing fuel will have been previously consumed. This is when respiratory protection will be the most critical. Bodies of water such as rivers, ponds and lakes -which happen to primarily reside at lower elevations and are more likely to be in the direction you should be heading. If you find a big enough body of water, get in as far from shore as possible and submerge yourself as low as you can and avoid any spots that may have overhanging trees. Low-laying "pockets" or depressions in the landscape if no water is available. If you find you have run out of room because of terrain restrictions, or out of time due to fatigue or the speed of the fire, then you may have to hunker down and wait the fire out. Obviously this is the least desirable option, but there are things you can do to greatly increase your odds for survival. Steer clear of dense vegetation -as this will surely burn under the intense heat of the approaching fire. Clear the immediate area of as much combustible material as you can. Lay down in the lowest point in the terrain. Cover yourself with anything that could serve as protection against heat and flame, such as mud, dirt, or sand or wet your clothes with any water you may have as a last resort. Lie face down to stay below the super heated current passing overhead as the fire nears and stay in place until it passes. The primary advantage of escaping fire at night is that you can see the fire from a greater distance than you can during the day. The downside however, is that you can not see the smoke, and navigating through foreign terrain in low/no light conditions can prove extremely dangerous since it slows your movement, and may cause you to end up trapped by the fire. When at all possible, find a creak or stream and follow it down (walking in it if it is shallow enough) and away from the area. Don't worry about gathering your gear -time is more valuable than gear. You can buy more gear later on. For this reason, it is smart to always have your pack (with the minimum essentials inside) next to you while asleep so that in needed you can wake up, grab it and go. While no one knows exactly what caused the Fort McMurray fire, one popular theory is that it was carelessly started by a campfire that was either left unattended or not properly extinguished. So remember to exercise caution and good judgment when building campfires during dry seasons or when fire bans are on. The damage to nature and the potential loss of life and property is simply inexcusable and completely avoidable. While this is by no means an exhaustive list of all possible things to consider, these points if followed can greatly increase your chances to successfully escape and evade a wildfire. With the ever-expanding reach of cell phone towers and satellite connected devices, technology can be an effective countermeasure tool. There are numerous apps available for areas where wildfires are prevalent that can warn individuals of high risk conditions and alert of fires as they develop so that hikers and campers have time to get to safety. Perhaps the best method of defense is proper pre-planning before you head out to the back country. Take the time to know the current weather conditions of the area you plan to explore beforehand and have a means to keep your phone charged if you know you will be in an area that supports mobile service. Carry a map and compass, identify and mark possible evacuation routes for each leg of your journey and make sure everyone in your group is familiar with information before you head out. Wildfires are seriously dangerous and many professional, highly trained fire fighters have died on the job, while wearing better gear and having more resources than you will have. Make the effort to learn what you need to stay safe -and then be sure to put it into practice. Your chances of survival may depend on it. I would love to hear your thoughts on this post and should you have any additional tips or advice for other readers, please be sure to leave them in the comments below. I always find it interesting when watching knife field tests, survival how-to's, bushcrafting and etc videos or when reading blogs how very few people actually demonstrate, much less emphasize the best practice of glove use while handling knives. Even in your basic 3 minute out-of-the-box knife review do you rarely see the presenter mention handle ergonomics in relation to use with gloves. I tend to think this is primarily due to both fundamental lack of appreciation of the benefits gloves can provide and the time of year most people tend to make their videos. In the wild, a small, seemingly innocent scrape or cut can quickly turn nasty with infection and add discomfort and invariably the need for medical care. I know of many seasoned back country enthusiasts, extreme campers, and avid hikers who spend endless amounts of research (and money) on all the best foot wear, hard/soft shells, etc. but who still can't see the value in a good pair of gloves for manual tasks. One common problem often tends to be that gloves are perceived for cold weather protection only. Insulated gloves are bulky, lead to diminished dexterity and make your hands sweat in the summer or during physical activity so they are avoided. But like anything else, having the right tool/equipment for the task can make all the difference. With the abundance of gloves presently available commercially, there are quite a few makes and styles that are, in my opinion, extremely comfortable. With the vast array of synthetic and natural materials and improved stitching and manufacturing, today's gloves are lightweight, durable and a must for anyone who regularly handles edged tools in the wild. I think there are pros and cons to any single type of glove, like there is with any knife, so ultimately I think it boils down to personal preference. They can prevent/minimize cuts. Many gloves these days come made with good cut resistant materials such as kevlar and are surprisingly thin. They protect the hands and fingers from coming into direct contact with metal components of your knife (the blade, parts of the tang exposed in the handle, etc) in extreme cold temperatures which otherwise may cause contact freezing with the exposed skin. Even with knives that have fully enclosed tangs in materials such as Kraton or rubber, should you need to choke-up (or use a deep finger choil) on larger knives i.e. for whittling, you are faced with skin to metal contact without gloves. Similar to the previous point, gloves act as a barrier between your hands/fingers and any sharp or rough edges during hard use tasks like chopping, thus preventing "hot-spots" which can in turn lead to blisters. They provide cushion against sustained-impact tasks that over time could lead to a condition known as Reynaud's (aka "white finger") syndrome. Depending on the palm material, you can get better purchase on your knife's handle due to the material filling the grooves on textured grips. Gloves also afford a more comfortable grip on larger handles that would feel too big in the naked hand. They protect against splinters from the wood you are working with or gathering afterwards. Personally, my favourites are a pair of BDG Goatskin Driver gloves. They are kevlar lined which puts them at ANSI Cut Resistance level 4 and are as soft as a pair of gloves could be. They are also extremely affordable at around $16 a pair. They are thick enough for adequate hand protection during common knife handling task, but thin enough to maintain modest fine motor skills at the same time. I prefer the goatskin due to its supple, long wear characteristics. They maintain good grip traction when wet and they are well suited for close fitting construction. I wear them whenever handling my knives or axe without exception whenever I in the back country or away from fairly immediate medical care. This includes when sharpening or striking a ferro rod to light a fire. Like anything else, you get use to them over time. It's simply not worth the risk of getting cut -or worse. Survival requires that we learn, practice and engage in life saving skills. There is no guarantee that in an unplanned survival scenario that you may have gloves or any other essential piece of kit, but in every other situation leading up to that, you do have a choice, and the opportunity to ingrain good habits and how you protect yourself now may determine your effectiveness later on at a time when it counts most. I'd be interested in your thoughts and comments about hand safety in the wild -or this post in general. What other advice would you give? What real life examples can you share? Be sure to leave your feedback in the comments below -I'd love to hear from you! A lot of people freely interchange the words survival and bushcraft when talking about the skills needed for existing in the wild, but for the purposes of this blog I'd like to clarify what I perceive to be the difference. When speaking of bushcraft, typically most people are referring to those sustainable skills applied in a primitive situation. Bushcraft is a learned adaptation to a deliberate set of circumstances we place ourselves in willingly. Bushcraft is a hobby, a "craft" -as the name asserts- and like any other craft, the individual is striving to master it through planned outings that replicate what they believe represent a bushcraft scenario. This involves (to a greater or lesser degree) a controlled environment where a person can be challenged, but not entirely endangered. Obviously situations vary and some choose to endure more risks and austere environments than others, but the common denominator is that the experience is planned, and knowingly entered into. Survival on the other hand is by its very nature abrupt and involuntary. It occurs when we least expect it, when we are least prepared physically and/or mentally, when we have the fewest supplies and equipment, when we are the furthest from help and medical aid, and when the environment and weather are at its least forgiving. We don't get to choose the scenario or when it ends; in fact we don't get very much say at all about the condition of the circumstances we suddenly find ourselves in -except how we act. To make things worse, we may already be sick with the flu, or suffering with a broken arm, or trying to manage a family crises at home. Survival isn't just a test, it's THE test. It's that moment you always thought you would have time to prepare for but suddenly realize you never got around to. It's that moment you suddenly scramble to remember that certain tip you read, that video hack on you saw on YouTube or that trick you learned about from that forum you last visited, because you know that you are drastically unprepared for what you are about to experience. All survival skills however are useful in bushcraft, however, very few bushcraft skills are applicable or relevant to survival since the energy and time needed to implement extensive basket weaving, a drying rack, or a wattle fence simply do not provide the return on investment that a legitimate survival situation requires. Compare survival to emergency first aid and bushcraft to continued (medical) care. When you need follow the ABC's to save a patient, wasting time instead treating for shock or trying to remember how to place the patient into the recovery position isn't helpful in that moment. If you need to survive in the most unforgiving climes, despite the lack of shelter, fire, food, freshwater, medical supplies, and communication with the outside world, then that is ALL you need to focus on learning how to do. Learning how to sustain an existence past surviving is good to know but not essential unless you plan to homestead. Learn what you need to know and practice relentlessly. Know at least two methods for building a fire, constructing a shelter, obtaining food (foraging and trapping), and purifying water without conventional means. and study field hygiene/sanitation. Knowing how to prevent illness and infection is much easier than learning all the medical knowledge required for dealing with them. But learn those too if you can. And finally, devote some time on learning how to self-rescue by learning the basic ground-to-air-signals and orienteering so that you don't sit idle waiting for help that may never arrive. True survival is not glamorous and it is not planned, but it can be managed and controlled if you educate yourself, get proper training, and practice your skills. It's not worth finding out the hard way that you don't know what it takes to make it back home from out of the wild. Simply put, the term zero-sum game or "zero-sum", describes a concept that asserts that in order for one thing to gain, another thing must do without -or in other words- "the early bird gets the worm" (to put it succinctly). This is the most sobering, fundamental concept at the core of survival, for in the wild resources are limited, so those who know where to find them, how to use them, and how to sustain their use will ultimately survive. Every living thing in the wild is constantly competing for resources in some manner or another with everything else and man, by farthest, is the weakest, most fragile competitor in the game. When thrust into a survival situation, your chances of success are entirely predicated on what you know, what you do with what you know and above all else, your ability to control fear and prevent panic. Having the best book on survival isn't worth a thing if you never took the time to learn and actually practice (and practice, and practice) the principles, methodologies and techniques presented within. Likewise, practice and technical competency alone will not ensure your survival if you are not capable of mastering your emotions and maintaining a calm and collected demeanour when things start going wrong. Making fire with a bow and drill in your backyard on a sunny day simply doesn't replicate real survival challenges enough to bestow competency in the skill when it really counts. Surviving in the wild, you may be soaking wet from days on end of being ill-sheltered from rain. You may be tired and hungry, and sleep deprived and the wood you aim to fashion your bearing block, drill and fireboard from may not be the same type you have in your backyard. There may be high winds, or the temperature may be so cold you lose dexterity and fine motor skills to the point you can't reasonably whittle or carve what you need. And there is definitely no warm, relaxing living room to retire to at the end of a failed attempt. When the stakes are that high, your functional level of skill will be revealed and you will learn if you truly have what it takes to survive. I know there are currently hundreds (if not thousands) of survival bogs, forums, sites, etc., so "what makes this blog different?" you might ask. Well, I hope to touch on topics that in my opinion have been underemphasized, mis-quoted or altogether missed or ignored by everyone else. It is my aim to patch those seemingly insignificant holes in everyday survival knowledge that could possibly make a difference to somebody who can benefit from it in a time of need. But for the most part, I intend to grow this blog organically and develop its narrative based on the commentary between my readers and me. To this end I welcome questions & comments on the topics I have posted and suggestions on any other topics you guys and gals think deserve some focus and discussion. I don't claim to know everything and I expect (and hope) to learn as much from each of you as you do from my posts. And while I will always strive for as much accuracy as possible, in some instances it may boil down to my personal opinion and/or preference -and when that is the case, I will indicate as much. I am excited about where this blog may go and hope it will be proven to have provided value and benefit to the many others who share my same passion for the wild. I have a diverse background which includes over 25 years of survival, military, law enforcement, and high-risk security experience in multiple theatres of operation including Central America, Europe, Asia and the Middle East. Additionally, I have trained and worked as a firearms instructor, personal fitness trainer, have been certified as an EMT, and have supported multiple clients in remote locations providing high angle rescue services. Currently I work in the oil and gas industry as a health, safety, security & environmental (HSSE) professional. I hope to use these skills and experiences, combined with my passionate love of the outdoors and a sincere respect for nature to share knowledge, offer advice, and continue learning myself from others in the fields of survival, bushcraft and field medicine (MIRA).